Was invited by Harper's Bazaar to attend Longchamp's 20th anniversary of their signature Le Pliage, which was held at Longchamp's ION store on Thu, 30th October. 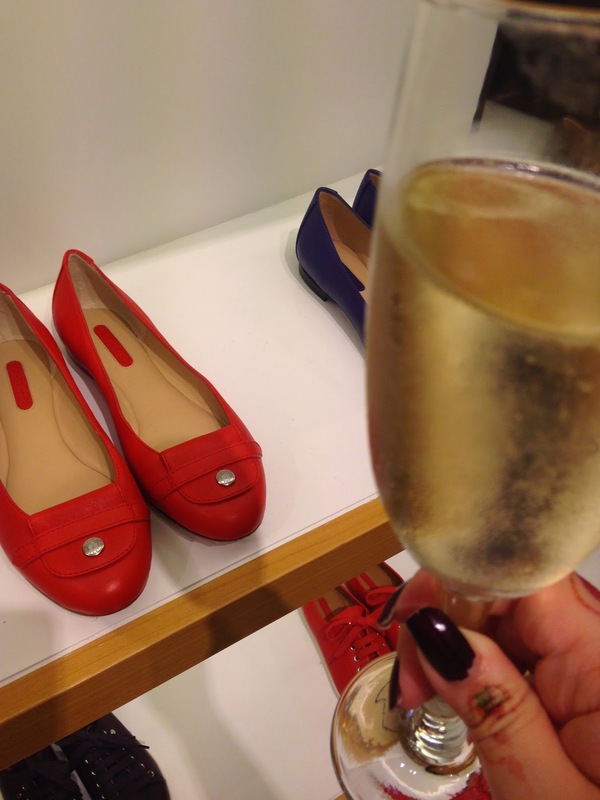 Of course there was champers and I was really delighted to find out that Longchamp has shoes and clothes too! Interestingly, they only had ballet flats and sneakers. No heels. Hmm. There was a talk on the latest collection of Le Pliage but there was no mic and no speakers, so mum and I couldn't hear a single word. We decided to simply stand at a corner and admire the mini Le Pliage and grab more canapes as they went by. Quite a shame really because I really like the full lambskin Le Pliage and I love love love the colours that they come in, and would've liked to know more about them. 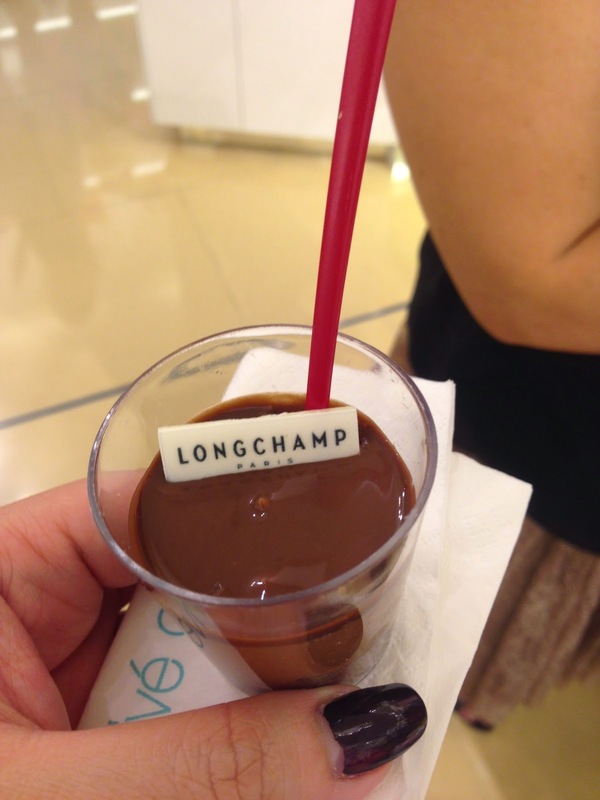 The models decked out in Longchamp attire and accessories walked around slightly aimlessly too. All of us attendees had 20% discount that evening but even after discount, the Le Pliage that I wanted costs S$680. I reckon it'll be cheaper in UK or Paris. Catering was by Prive Group and I love the branded chocolate mousse. When serving canapes or bite-sized desserts, I like it when it comes in a cup or spoon. It's a lot easier and cleaner when we grab them to eat. 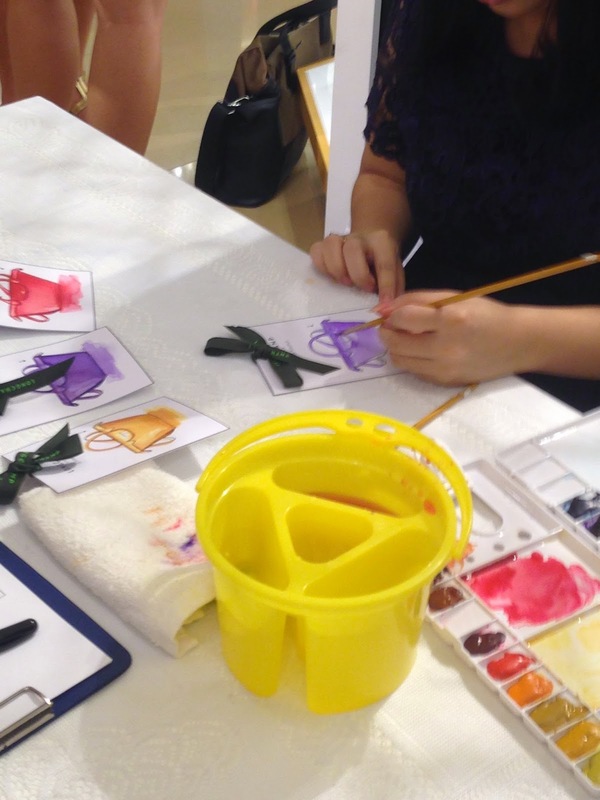 Something else that was "personalised" and branded were the handpainted watercolour bookmark of the Le Pliage in the limited edition colours of purple, red and yellow. Looking at the list of 'orders', purple and red are the favourite colours. The artist told us that the 3 samples in front of her would be sent to the Paris Longchamp HQ! As you can see, I chose the red Le Pliage while mum chose the purple. 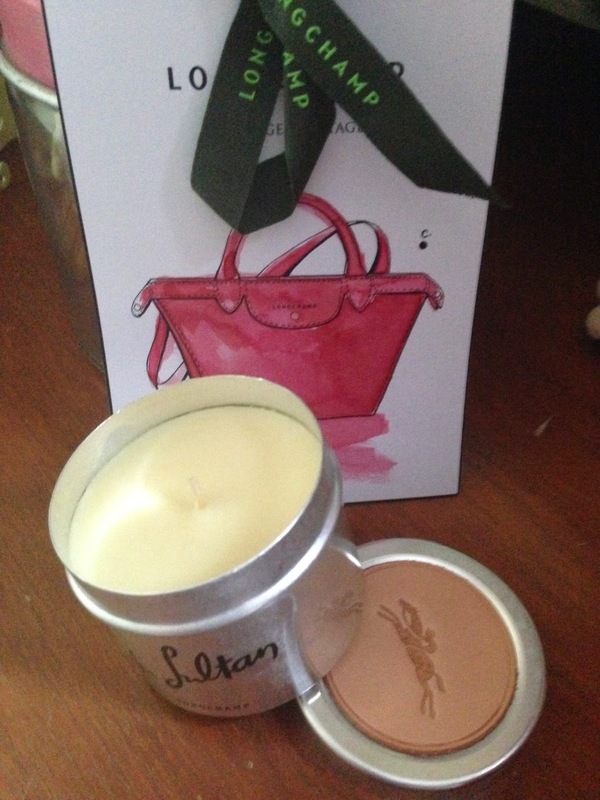 Another door gift was a scented candle Au Sultan, also by Longchamp. It's fragrance is not your typical powdery or flower scent but a little musky and I don't even need to burn it for the smell to permeate my room. I just leave it open (just like in the photo). Thanks Harper's Bazaar and Longchamp for the invite! I'll definitely get the Le Pliage as it's great for travelling (the lambskin version comes with detachable straps)!